'A double white bombshell': that is Bridal Gown in a nutshell. The flowers are completely filled, bright white and fragrant. For a long time it was thought that this flower would become the competitor for Duchesse de Nemours, but that struggle seems to have been lost. 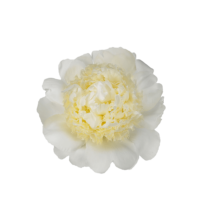 Nevertheless, this peony has a powerful, exuberant core and an elegant appearance. Bridal Gown first blossomed in 1957 and registered in 1981 by Klehm. Klehm has registered dozens of peonies, including Carl G. Klehm that’s named after him. This peony is a seedling of another well-known white; Charles White.